plaid pants is where they might have gone. It's January 16, 1965. It's Georgie Fame, The Moody Blues, and The Righteous Brothers on the charts for the next four weeks, while at the tail end of the four weeks the Rolling Stones take over the album sales with their imaginatively titled The Rolling Stones No. 2. The most significant thing to happen in these four weeks, however, occurred on January 24th, when Sir Winston Churchill, twice former Prime Minister, dies. 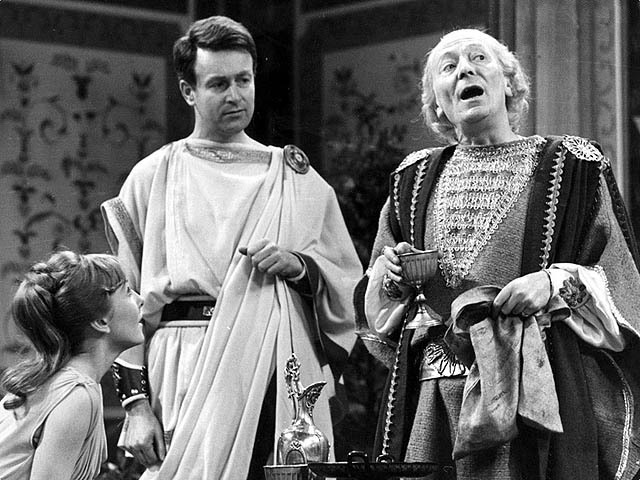 His state funeral on January 30th coincides with the third episode of The Romans, the Doctor Who story du jour for the month. Production wise, The Romans sees the return of Dennis Spooner, which, if you recall my views of his previous story, should give you a sense of where this is going. In addition to writing the story, Spooner has also just assumed the position of script editor for the series. Script editor, for the original run of Doctor Who, was the closest position to the current role of head writer/executive producer. The biggest difference is that rules prohibited script editors from commissioning themselves to write scripts in most circumstances. Instead, generally speaking, they did revisions and rewrites to other scripts. But with some frequency the situation got complicated and various pen names and other schemes arose to cover the fact that the script editor had written a script themselves. In this case, David Whitaker, the outgoing script editor, hired Dennis Spooner to write The Romans, then quit, and his replacement, Dennis Spooner, hired him to write The Rescue. Oh, and for accounting purposes, The Romans is actually The Rescue Parts 3-6. It's fitting, given all of this, that The Romans is the first Doctor Who story to be explicitly devised as a comedic farce. (Indeed, it's also basically the last one until Partners in Crime in 2008.) So, a comedic historical tale. Exactly what one imagines the nation wanted as their great wartime hero of a former prime minister is buried. Of course, Churchill's legacy in the UK is somewhat more complex than one might assume. In the election immediately following the war, the Tories were hammered and he was replaced by Clement Atlee, who, in historical hindsight, is actually about as much of a lion as Churchill. Then, in 1951, an aging Churchill was returned to power for a frankly lackluster second spell that did no favors for his reputation. Churchill, in his second term, fought hard to keep the British Empire together. By 1965, the empire was all but gone. In other words, Churchill, though unmistakably a national hero and national treasure, was also part of the fading old Britain. Watched through that lens, The Romans does not necessarily seem like less of a mismatch for the national mood, but it at least becomes somewhat more interesting. On the one hand, The Romans, despite being a comedy, is fundamentally a conservative story, miles from the oddly post-anarchistic youth revolution of the last two stories. The Doctor's adventuring spirit that blossomed in the last two episodes has mostly vanished, he's back to abusing Ian and Barbara, and all sense of ambition towards challenging storytelling is out the window. Which makes this oddly apropos for mourning the old Britain. On the other hand, there are ways in which the show seems to resist the over-simplification. The storytelling as a whole may be unambitious, but it does open with one of the most unusual starts of an episode - the TARDIS falls off a cliff, and we cut to a month later with the TARDIS crew vacationing in a Roman villa, showing that the idea that stories start with something bad happening to the TARDIS and the crew trying to get it back/back to working order. The story also pushes the characters subtly. I've spoken in past entries about the lack of significant support in the show thus far for the theory that Ian and Barbara are lovers. That goes out the window with their scenes at the Roman villa, where they have a visible intimacy that we've just never seen before. If the Doctor has regressed in his general behavior and treatment of Ian and Barbara, however he's helped by the fact that Susan, who Reign in Terror demonstrated pretty conclusively Spooner can't write for, is gone. Instead we have Vicki, and the Doctor has a whole new relationship to set up. A brief word here about Maureen O'Brien. Much has been made of the scope of the task Patrick Troughton faced in season four in reinventing the role of the Doctor. But Maureen O'Brien's Vicki is mostly overlooked as a major companion despite the fact that her job was identical to Troughton's - revamp the role of the companion, and in particular the young girl companion role originated by Carole Ann Ford. Yeah, her character suffers continually at the hands of writers who view the young girl companion as there so they have something to have the monsters kidnap. But she gives the role some real effort, and is easily the most charismatic person in the cast. This story is structured in order to give her some real chance to shine. Ian and Barbara are sent off on a separate plot so that Vicki gets to be the main companion to the Doctor. The Doctor, for his part, seems primarily interested in impressing Vicki this episode. He ditches Ian and Barbara to take her to Rome and spends almost the whole time showing off, including one of his most memorable name-drops as he claims to have trained the Mountain Mauler of Montana. It's worth commenting on the Doctor's tendency to name-drop his involvement in various historical figures' lives. He begins this with Ian and Barbara, which implies a lot of adventures before he met them. Certainly there's a case to be made for that - and a lot of writers have focused on that period, including Marc Platt, who wrote a contender for one of the best episodes of the classic series. But as I've argued pretty extensively, the case for pre-Unearthly Child adventures is weak given the Doctor's temperament and clear lack of experience in dangerous situations there, and the development of his character into actually seeming to like people since then. Which really poses no problem in terms of his name-dropping. It just means he's lying. Which makes total sense after seeing this episode, given that he simultaneously claims to have inspired "The Emperor's New Clothes" and claims he wouldn't do something like inspire the Great Fire of Rome. Of course he makes up encounters with famous historical figures to impress the girls. It's completely consistent with his character - especially when you take into account the fact that lying is the only way to account for the disparities in claims about his age. The idea that the Doctor is lying about his past adventures seems relatively compatible with the writers' intent in these episodes. It's clear watching Unearthly Child that Coburn intended that to be more or less his first adventure, and there's only a handful of relatively small encounters that Susan corroborates, neither of which appear to be full-fledged adventures. But it also ties in well with things that the writers could not possibly have had an idea of. For instance, it's clear the writers intend the Doctor to be the old man that he appears to be. But in this story, he, for lack of a better phrase, does not act his age. He enjoys getting into fights, tries to impress the ladies, and is extensively vigorous. Which makes sense in the context of later developments - the Doctor is, in fact, a young man here. Actually this interpretation works pretty well in most Hartnell stories - try watching one with that in mind. It's certainly reliably entertaining, and helps tremendously in this episode, particularly when the Doctor is giddy at the notion that he helped cause the Great Fire of Rome. The Doctor as giddy pyromaniac anarchist is an easier sell if one imagines the guy as being about equivalent to 17. Ah, yes. The pyromaniacal anarchy bit. Because here's the thing - the story ends with Vicki and the Doctor helping to torch Rome, and both of them seeming downright delighted with it. Suddenly the character that, visually, is the most Old Britain character on the show is allied with the New Britain youngster in wanting to burn it all down. What's most interesting is that this seems almost accidental in the story. The story is a lowbrow runaround of a farce that even Jacqueline Hill seems tired of by the end, in no small part because her entire plot involves being sleazily hit on by Nero. (Spooner did basically the same thing to her in Reign of Terror, which, actually, borders on being a bit of a thing.) The story's lone solidly funny gag is the professional poisoner. There is nothing ambitious in this story, little yet pyromaniacally anarchistic. But here - unlike the last time Spooner furnished the show with a turkey of a historical - something has happened. The show has enough strength that interesting and challenging material comes out of the concept on its own. Do you own The Romans on DVD yet? If not, consider buying it from Amazon via this link. I'll get some of the money if you do. In the words of Amy Pond: "Every room you walk into, you laugh at all the men and show off to all the girls." Hmmm... I've just watched this and had a completely different take. I did find it funny. I thought this was one of the first episodes where Hartnell seems to be genuinely enjoying himself, which I found magnetic, and increased my own amusement. I was also deeply concerned for Ian & Barbara in a way that I rarely am with companions. Nero is a farce here, but his first appearance is truly menacing, and the Doctor's dealing with him is great. The chasing around the halls gets stale quickly, but remains memorable. Really, this one seems to speak to a lot of the sensibilities of the modern series, and would be an episode I'd probably show a newbie if trying to show them the merits of the Original Doctor. Or maybe I'm just a sucker for a buddy comedy.